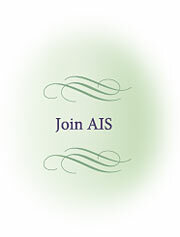 The AIS sells books, pamphlets and other iris related items through the AIS Storefront. Please find the listing of items available from the AIS Storefront below. Thank you for your support of the AIS. Orders may be placed by fax or via e-mail at anytime. Pricing: Prices are as listed with each item. Note that prices may vary according to the requested shipping destination. There are three types of shipping destinations: USA, Canada,and International. All prices/payments are in $US. Prices include shipping and handling fees. Make checks or money orders payable to: American Iris Society. The AIS can now accept VISA or Mastercard for your AIS Storefront purchases (minimum credit card purchase $10.00). Include VISA or Mastercard number, expiration date, name on credit card, ship to address and phone number with your order. Shipping: The AIS Storefront ships via Media Mail where possible. For Priority, Overnight and UPS shipment, additional charges are paid by customer. Nine different iris images on card stock (1 ½” x 7”). Available in packet of 45 (5 each of 9 images). FREE to include FREE S&H. Great for handouts for AIS Membership promotion. A variety of programs in digital format are available from AIS via order form. To order convention programs, Iris Introductions, and Programs, click here to download the form. Fill out the form, and follow the instructions to place your order. There is presently an opportunity to order your AIS 2020 Iris Calendar at an Early Order Special Discount. The Early Order Special Discount will end May 1, 2019. Calendars are now available. Please place your order through the AIS Storefront. Early Order Special Discount (cutoff May 1, 2019): USA Individual copy $7.00, Packet of 10 $40.00; Canada Individual copy $9.00, Packet of 10 $50.00; International Individual copy $12.00, Packet of 10 $60.00. Prices include S&H. Standard Prices: USA Individual copy $8.00, Packet of 10 $50.00; Canada Individual copy $10.00, Packet of 10 $55.00; International Individual copy $14.00, Packet of 10 $65.00. Prices include S&H. To download the order form for the calendars with all the details check here. BEARDLESS IRISES, A Plant for Every Garden Situation” by Kevin Vaughn. Many gardeners know little or nothing about beardless iris. But beardless irises are sure to gain your interest, extend your iris bloom time, and fit a spot in your landscape. All five major groups – Siberian, Japanese, Pacific, Coast Native, Louisiana and Spuria – of beardless irises are covered in detail. Hardcover: 160 pages with colored images. Price: $30.00 USA, $40.00 Canada, International – contact Storefront for price. MEDIAN IRIS SOCIETY 50TH ANIVERSARY HISTORY EDITION OF THE MEDIANITE. Price (includes S&H): USA $25.00, Canada $28.00, International - contact Storefront for price. MARIE CAILLET (1915-2010) – A special publication by the Society of Louisiana Iris honoring Marie Caillet. Price: $10.00 + $3.00shipping each USA. Canada and International - please contact Storefront for price. Order by Theme # or by Theme Name. Each theme includes 8 different pictures, 8 envelopes and 8 AIS Seals. Each Note Card is 4 1/4 " x 5 1/2" bifold. Price is $7.00 per packet USA, Canada $8.00; International $11.00. This is a revised edition of the first complete reference published on Louisiana irises, the five species of Iris in section Hexagonae. These beardless irises are endemic to the United States, with their center of distribution in Louisiana. They first drew attention because of the enormous number of their natural hybrids; this propensity for hybridization led to the development of today’s spectacular range of colors and forms. This authoritative treatment by The Society for Louisiana Irises is based on the first edition published by the Society in 1988, but it is considerably expanded. 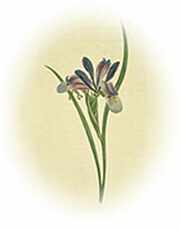 It covers every aspect of the history, botany, and development of these distinctive irises, with particular emphasis on the newest hybrids, hybridizing techniques, and cultural practices, and also includes suggestions for their use in the landscape and in floral arrangements. It should serve to introduce a wider gardening public to these most colorful and versatile flowers. Price: $30.00 includes shipping in USA. Canada and International - please contact Storefront for price. RVP PIN: This is a service pin that may be purchased and awarded by AIS Regions to the outgoing RVPs in recognition and appreciation of their term of office. Sterling Silver with presentation box. Price: $35.00 each. Highly recommended! 32 pages of full color. Edited by Warburton and Hamblen, 34 contributors and authors including international authorities. Published in 1978, a most authoritative book on all phases of irises. Scientific and popular. 6"x 9", hard bound cloth cover, 494 pages. Price: $19.00 USA, Canada $22.00; International $35.00. INSERT: (complete update/pages) (use same cover as Sixth Edition.) Price: $16.00 USA, Canada $22.00; International $32.00. INSERT W/COVER: Price $19.00 USA, Canada $25.00; International $35.00. Price: $7.00 each USA, Canada $8.00; International $10.00. Packet of 25 for $82.00 USA, Canada $105.00; International $119.00. Postcards are full color with 16 postcards per pack. Price: 3 packs for $4.00 USA, Canada $6.00; International $8.00. Contact AIS Storefront for SPECIAL DISCOUNT for larger quantities. These Registrations and Introductions (R&I) booklets contain a listing of all of the new irises registered with the AIS for the single year indicated. Price for 2000-2009 R&I Booklets: $4.00 each USA, Canada $5.00; International $8.00. Price: $13.00 each USA, Canada $14.00; International $16.00. Each of these are books that provide a ten year compilation of registrations and introductions (R&I). 1939 Ten year compilation of registrations, 1930-1939. 1949 Ten year compilation of registrations, 1940-1949. 1959 Ten year compilation of registrations, 1950-1959. 1969 Ten year compilation of registrations, 1960-1969. 1979 Ten year compilation of registrations, 1970-1979. Price: $9.00 each USA, Canada $15.00; International $25.00. 1989 Ten year compilation of registrations, 1980-1989. All 7 Ten-year Checklists for $28.00 USA, Canada $44.00; International $66.00. Soft Cover - $25.00 each USA, Canada $48.00; International $66.00. Hard Cover - $34.00 each USA, Canada $57.00; International $75.00. Current year and last year: $8.00 each USA, Canada $11.00; International $15.00. Older issues (not all available) $5.00 each USA, Canada $8.00; International $12.00. Price: $3.00 each USA, Canada $5.00; International $8.00. 10 for $18.00 USA, Canada $21.00; International $26.00. Self adhesive ovals. Official design in blue and green on silver background. Price: One pack $5.00 USA, Canada $7.00; International $10.00. 5 Packs for $12.00 USA, Canada $15.00; International $18.00.